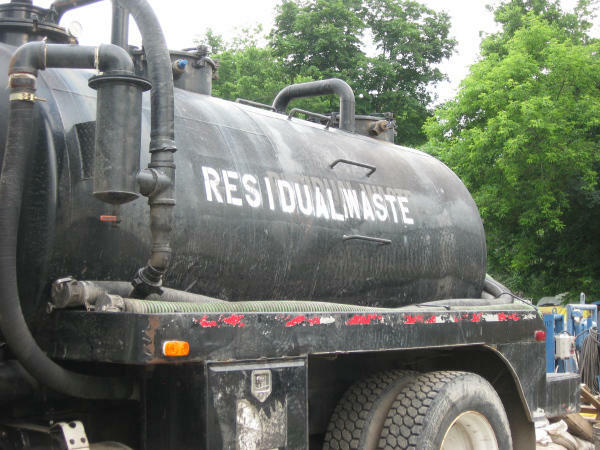 Residual waste truck in Pennsylvania. The Environmental Protection Agency regulates the disposal of toxic or hazardous materials. Such waste includes things that may contain heavy metals, chemicals, dangerous pathogens, radiation, or other toxins. Horizontal drilling produces both liquid and solid waste streams which can contain heavy metals, dangerous chemicals, salts and radiation. But you will never hear it referred to as toxic or hazardous by anyone, officially. Amy Mall, senior policy analyst with the Natural Resources Defense Council, a Washington-based nonprofit, explains that thirty years ago the EPA exempted oil and gas waste from the Resource Conservation and Recovery Act (RCRA). “So right now, oil and gas waste, regardless of how toxic it is, can be treated like normal household waste in many parts of the country,” Mall said. There’s a new report: (Wasting Away - Four states’ failure to manage oil and gas waste in the Marcellus and Utica Shale) that examines this subject published by Earthworks – a nonprofit concerned with the adverse impacts of mineral and energy development. Lead author Nadia Steinzor explains that the EPA didn’t exempt the industry because the waste wasn’t considered a threat, but because state regulation of this waste was considered adequate. Of course, this was a couple decades before the horizontal gas drilling boom. Steinzor and her colleagues decided to see what they could learn about waste practices in West Virginia, Ohio, Pennsylvania, and New York, where Marcellus and Utica shale gas are being developed. The report indicates that states are well behind the curve in adapting to the natural gas boom: good characterizations of the waste is incomplete according to a 2014 study that’s cited; and not much information is available about where the waste is coming from, going to, or how it gets there. Drill cuttings dumped at WV landfill. West Virginia Department of Environmental Protection officials say most information that does exist about oil and gas production and waste disposal procedures is available online. What information isn’t public can be accessed with a fee and a Freedom of Information Act request. DEP spokesperson Kelley Gillenwater says her agency is going above and beyond what’s required by law to make information more accessible and is currently working on a project to digitize and make public the information they collect. She says, however, that project is in the early stages and a timeframe for completion doesn’t exist yet. Steinzor’s report argues that states don’t require enough information and often rely on operators to self-report in good faith. The Earthworks report cites a 2013 study that says nearly half of all liquid oil and gas waste is shipped out of state, the remainder is injected underground. But Amy Mall from NRDC says rules for injection wells everywhere are also in need of attention. 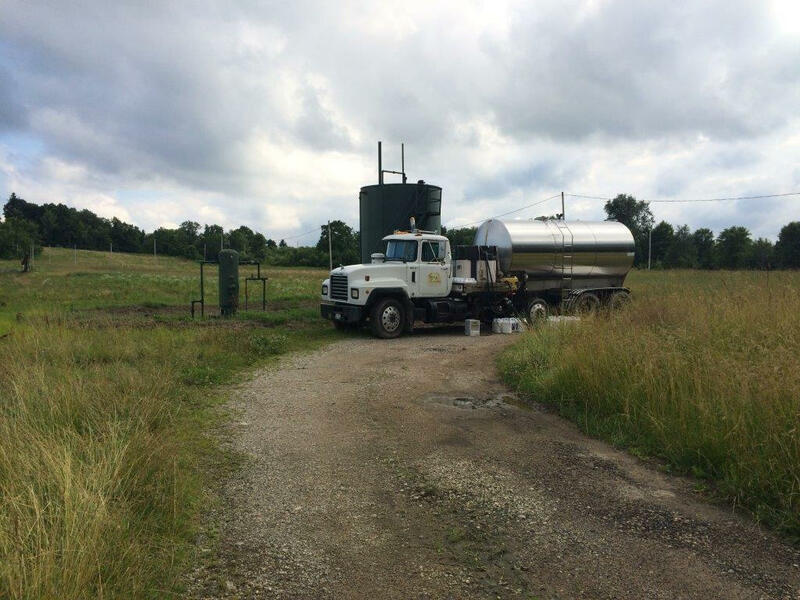 Truck at an injection well in Ohio. Steinzor does credit West Virginia for taking some steps to address solid waste problems in the state. The sheer volume of drill cuttings, which at one point was simply being buried onsite, may have helped force the issue. 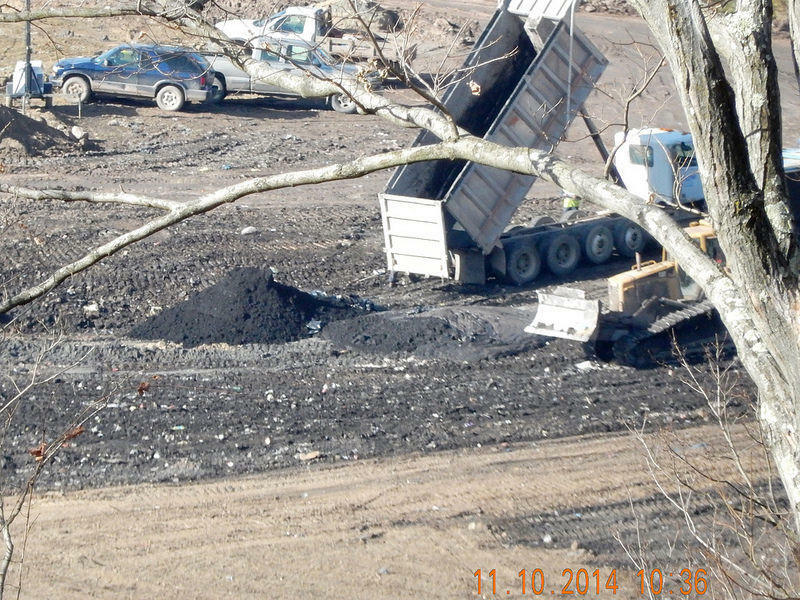 Municipal landfills do accept the waste even though it’s largely uncharacterized. Requirements are now in place for the waste to be held in separate storage cells within landfills and DEP is working with Marshall University to study the leachate from those facilities. Results from that study are scheduled to be presented to state lawmakers this July. West Virginia University is also teaming with the Department of Energy to better characterize waste streams from two Marcellus wells in Morgantown. Drilling is expected to begin in November. One other thing West Virginia may have going for it is a small office within the DEP, the Environmental Advocate Office. “The advocate office really grew out of DEP’s recognizing that there’s a growing environmental awareness in the public and that citizens want to be part of the conversation,” said John King, an Environmental Resource Analyst within the Advocate Office. King fields many calls from citizens concerned about oil and gas waste management as well as other issues related to gas development. While it may not be the responsibility of members of the public to be the boots on the ground for the DEP, King says protecting state resources and public health may nonetheless require participation and investment of communities throughout the state. His office is interested in facilitating better communication between industry and community stakeholders. A state board says two underground injection wells in Fayette County can't operate without a permit. The West Virginia Environmental Quality Board says the Department of Environmental Protection violated state law when it allowed Danny Webb Construction to operate the injection wells in Lochgelly without a permit. The state of New York has banned fracking. After six years of study, the state says there are too many health and environmental questions involved in the controversial drilling method. NPR's Jeff Brady reports. 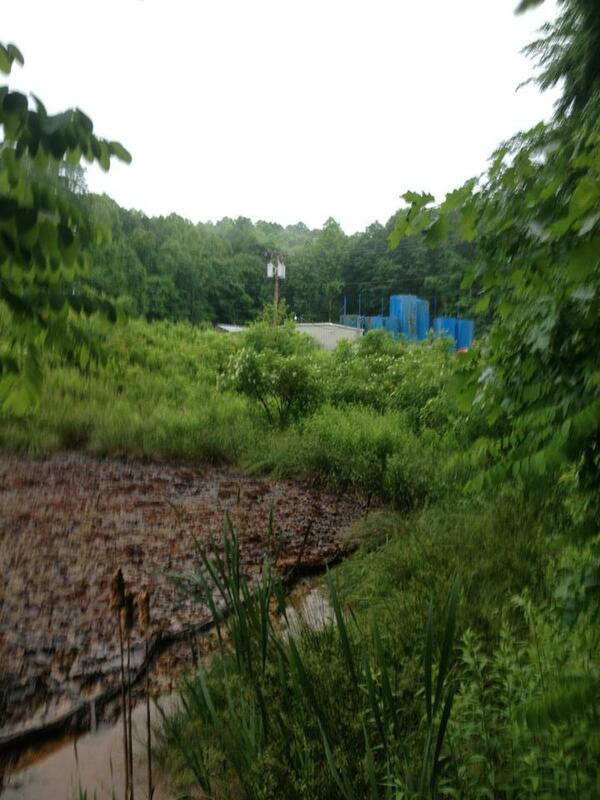 The natural gas boom continues to sound in what have become the northern gas fields of West Virginia. State lawmakers are working on ways to take maximum advantage of the economic benefits that are coming with it. The other byproduct authorities are grappling with is an excess of waste products, which, without proper disposal, can threaten public health. The U.S. Environmental Protection Agency is seeking public comment on ways to disclose information about the chemicals used in the oil and gas drilling process known as fracking. The EPA says in a Friday release that it is also seeking input on incentives and programs that could help develop safer fracking chemicals.